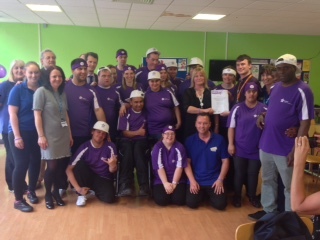 I'm the coordinator of the Hertfordshire Abdominal Aortic Aneurysm (AAA) Screening Programme and we were recently awarded a Purple Star for our work with people with learning disabilities. We started working towards this award with the Hertfordshire Health Liaison Team in February 2015. What is the Purple Star? 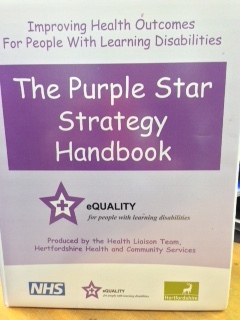 The Purple Star Strategy improves access to equitable health care services for people with learning disabilities. It is being used to raise awareness of the needs of people with learning disabilities and to influence change in how services are delivered within the local community. The Purple Star branding indicates delivery of a high quality, reasonably adjusted service for adults with learning disabilities. Training was given to all the Hertfordshire AAA screening team: the coordinator, administrator, 5 screening technicians, the clinical skills trainer and vascular nurse specialist. The training was conducted by our named community learning disability (LD) lead nurse and an expert by experience. Each member of the team completed a workbook which they then sent to the health liaison team for assessment. These workbooks included examples of reasonable adjustments that can be arranged for each individual in our AAA clinics and learning all about T.E.A.C.H – Time, Environment, Attitude, Communication and Help. We were also granted a licence to use Makaton signage in our clinics and have developed an easy read consent information leaflet. We have a purple folder where we now document any adjustments that we make whenever we scan a man who has learning disabilities. We are subject to ongoing monitoring to ensure the standards continue to be met. We are going to put a purple star sticker on our invitation letters so that men with learning disabilities will know it is a safe environment and that they can contact the programme and ask for reasonable adjustments if necessary. The standard tells organisations how they should make sure people with disabilities receive information in formats they can understand and receive appropriate support to help them to communicate.